Price is $319 per Juvenile Pair. Shipping next in October of 2019. We sell the white mandarin duck pair as YOUNG ADULTS. Our next pair will not be available until October 2013. White mandarin ducklings are a rare breed of wood duck. 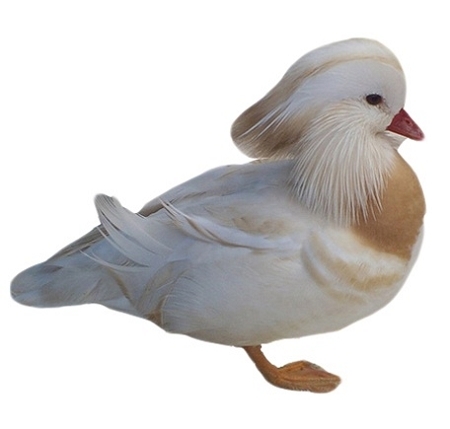 The white mandarin is a small perching duck closely related to the American Wood duck, they are native to both European and Far East regions. The white mandarin duck is prized for its symbolism of beauty, happiness and fidelity as a pairing will develop a strong bond. The female looks much like the Wood duck female. The drake in breeding plumage is probably the best looking duck around. The bill is a bright red and the top of the head has almost a florescent green and purple feathers running down the back of the head. The eyes are surrounded by white feathers running back down the neck followed by whisker like feathers off the neck in a chestnut color. The breast is a deep wine color with white below. Probably the most distinguishing part of the drakes are the orange sails that stand up behind the wings. White Mandarins are quiet, easy to keep and can tolerate the northern climates as long as shelter is provided for extreme cold or heat. They are fairly easy to obtain and do not require a federal permit. Courtship begins in winter with the breeding season starting in April. In the wild they can be found nesting in tree cavities close to water. For the waterfowl hobbyist the same raised nesting box that is used by the Wood duck is also used by the white mandarin. They make good mothers, normally laying one clutch of 8 to 12 beige/buff colored eggs, with a hatching period of 28 days. Except for one male, I keep mine full wing in an outdoor aviary I have built. In it I have some large branches for them to perch on. They are good fliers (begin flying around 7 weeks) so either overhead netting should be used or they should be pinioned or the flight feathers kept clipped. Like many wild ducks, white mandarins are skittish and don't tame as easily as domestic ducks. They also usually do not do well being displayed in poultry shows. Some additional notes for those raising/breeding white mandarins. A few weeks before the hatch, you may want to begin putting some food on a small flat plate, this way the adults will get use to seeing the plate, it is easier to access for the ducklings the first week or so. Once they have left the nest, remember that your water source needs to have a way for the little ones to get out of. A ramp of either wood or hardware cloth works well. White Mandarin and Wood ducklings are great climbers and are small enough to fit through a 1 inch opening the first week or so. I have been asked about the drake with the little ones, it has been my experience that the drake has never shown any aggressive behavior toward the ducklings, and the hen seems to allow more white mandarin duckling2contact with them then the Wood hen allows her drake. Be aware of the distress call the ducklings make, you may come out one day to find one stuck somewhere in your pen, the call they make is quite distinct. On feed, you could grind up some of the pellet feed you currently use (blender, course setting) if you cannot find a smaller bag of a crumble feed. White Mandarins are generally priced as pairs. White white mandarins are priced significantly higher than normal colored ones because they are rarer and are somewhat harder to reproduce. The parents of both colors here at Acorn Hollow are selected for high quality coloration and for characteristics like well developed manes, crests, and sail feathers. Birds sold are normally from the current year's hatch unless otherwise stated. Such birds usually will reproduce the following spring but perhaps 20% of them will wait until their second year to breed. Males shipped may be only partially colored up. Young white males in particular are slower to come into their nuptial plumage than are adult males. Usually, all available birds are sold by early fall. White and normal colored White Mandarins will cross. It is recommended that if both colors are kept, that the pairs be kept separately at least until the pairs are bonded. Ideally, the two colors will not be kept together during the breeding season. Given enough space, multiple pairs of white mandarins can be easily kept in one pen during the breeding season. A 100 square foot enclosure will usually house two pairs comfortably. Three nest boxes should be supplied for every two pairs of birds. That will increase the likelihood that both pairs will find one they like. Unless otherwise requested, White Mandarins will be shipped full winged which means that they are fully capable of flight. Wing clipped birds incapable of flight until their flight feathers are replaced the following year can also be provided but must be specified when the birds are ordered. Beautiful birds, just had -30 degree weather and the birds are doing very well. They go in their shelter at night and swim in heated pond as the mood strikes them.